1. My daughter turns one in June … when should I start swim lessons with her? As soon as possible! Research associated with children starting swim lessons earlier verifies those children have an incredible advantage over those that do not participate in swim lessons in key developmental areas. Give your child an advantage early on as swimming lessons boosts the development of the whole child because early year round lessons for young children accelerated their development physically, intellectually, and emotionally. 1. Children who swim consistently from infancy are significantly stronger and more coordinated. 2. Children score higher for intelligence and problem solving, which carries over into excellent academic achievement. 3. Emotionally, children have been found to have more self-discipline, greater self-control and an increase in desire to succeed. 4. Children rated higher in self-esteem and were more independent and comfortable in social situations than non-swimmers. 5. 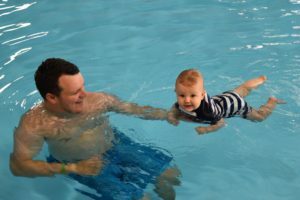 Swim lessons for babies and toddlers improve their physical development. 6. Baby swimmers develop better balance, movement and grasping techniques than non-swimmers. 2. What does a baby learn in lessons? between child and parent that participate in these lessons together. 3. How many babies and parents are in a lesson at a time? We have a maximum of 6 babies along with their parents. 4. Who teaches these classes? Our trained coaches teach our baby classes. 5. When are baby lessons offered and how much? We offer a number of lessons Tuesday-Sunday. The cost is $80 per month with an annual registration fee of $50. If you mention this blog, we will reduce the annual registration fee to $25.